The chosen premises located in Chelsea, were transformed from a basic retail space into a light and spacious environment accommodating treatments on both levels, including beautiful bespoke treatment rooms. 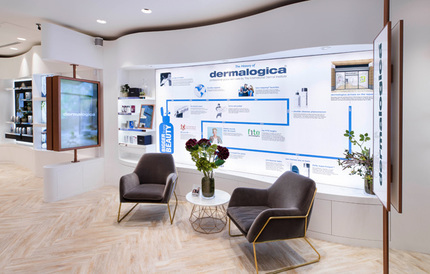 The project timeline from the initial meeting to the Dermalogica flagship store opening its doors and going live, was 17 weeks. Our dedicated Project Management team ensured all parties were kept updated and the project stayed on track allowing Dermalogica the confidence to open the store in time for the pre-Christmas trade. Component design and fit was an integral part of this project. Our development team’s experience of skilled designers created and implemented an extensive range of bespoke interior products. Project implementation was managed and executed to perfection with minimal upheaval and downtime. The Principle team utilised their considerable experience in brand implementation to manage this prestigious project, ensuring every stage ran smoothly and effectively, delivered on time and on budget. This beautifully designed store is the largest in the UK.